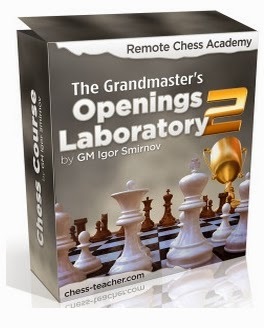 You can get a 10 USD discount for the new course: “The Grandmaster’s Openings Laboratory – 2“. Indicate the discount coupon GOL2 while placing your order and it will reduce the price for you. The new course complements his previous opening course “The Grandmaster’s Openings Laboratory” (LINK). You should not buy the 2nd course if you don’t possess the 1st one. At the same time, he do understand that buying 2 courses simultaneously can be expensive. That’s why he’ll give you 10 USD discount for the 1st opening course as well. You can use the same discount coupon GOL2 while purchasing “The Grandmaster’s Openings Laboratory” course and it will reduce its price. The first 50 buyers will get a free BONUS of his personal support while studying the course. You’ll be able to send him your questions and get them answered. This will ensure that you digest the course’s material well. The next 100 buyers will get his answers as well, but will not be able to ask their questions. Please note that 150 is not so much when compared to 20,000+ of his on-line students. However, he can’t serve too many people personally and that’s why the amount is limited. Initially he had doubts if he should provide any other bonuses. But today he is in a good mood, so here we go. Perhaps he’ve never made so many “special offers”. This will be the last one. Most of his long-term students have already studied his previous courses. However, there are some new people here as well. If you happen to be in this group, let me give you a piece of advice. BEFORE studying specific opening lines, you should learn the fundamental chess principles. Otherwise you’ll have to memorize variations mechanically, which is a dull and less productive work. Again, he understand that buying a few courses together may be expensive. That’s why he’ll provide 15% discount for the above 2 courses (you may pick the one you like better). While placing your order, please indicate the discount coupon BASE15. This will automatically cut 15% off the price. Let me remind you that all of these special offers will only last until the 2nd of November.